The Maha Mrityunjaya Mantra is a prayer to Lord Shiva (part of the hindu trinity, the lord of destruction, penance and meditation) to help overcome "death". It is called the Maha Mrityunjaya mantra, the Great Death-Conquering mantra. It is a mantra that has many names and forms. 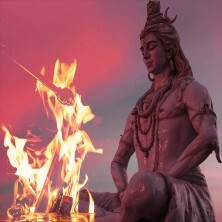 It is called the Rudra mantra, referring to the furious aspect of Shiva; the Tryambakam mantra, alluding to Shiva's three eyes; and its is sometimes known as the Mrita-Sanjivini mantra because it is a component of the "life-restoring" practice given to the primordial sage Shukra after he had completed an exhausting period of austerity. The Maha Mrityunjaya mantra is hailed by the sages as the heart of the Veda. Along with the Gayatri mantra it holds the highest place among the many mantras used for contemplation and meditation. The seeker is more concerned with avoiding spiritual "death" rather than physical "death". The mantra is a request to Lord Shiva to lead us to the mountain of meditation, which is indeed Lord Shiva's abode. Legend has it that Lord Shiva appeared before his devotee Markandeya (who was destined to die at the age of sixteen) and stopped his aging process a few days before he was supposed to turn sixteen. Thus, death would never be able to claim him! Hence, this mantra is also referred to as the Markandeya mantra in classical hindu studies. The mantra should ideally be repeated 108 times, twice daily, at dawn and at dusk. It is particularly useful for meditation and yoga practice. It is believed that to overcome the fear of death, Lord Shiva himself gave humanity the Mahamrityunjaya Mantra. This mantra restores health, happiness and brings calmness in the period of death. When courage is blocked, it rises up to overcome obstacles. This mantra is really powerful and even regarded as a life saving prayer.